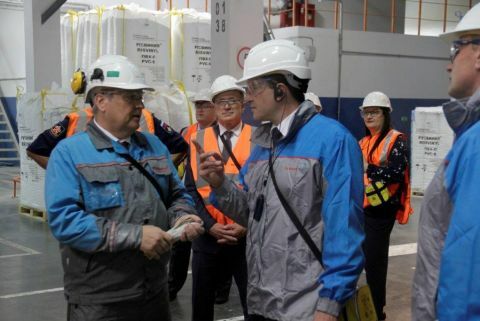 On August 16 within the frame of a business visit to the Kstovo district Acting Governor of the Nizhny Novgorod region Mr.Gleb Nikitin visited the PVC-production site of the joint venture of SIBUR and Solvay – RusVinyl – and got acquainted with the production process of the company. During the site tour Mr. Gleb Nikitin visited the three main steps of production as well as the finished product warehouse. Moreover, the head of the region visited the control room from where control and management over the technological processes in all the plant take place remotely. RusVinyl produces suspension and emulsion PVC, one of the most used polymers in construction, automotive industry, electrical industry, production of furniture, packaging materials, consumer goods, shoes, clothes, sports tools. Whereas as of now this is the only emulsion PVC producer in Russia. The company is successfully operating in the Kstovo district since 2014, and after four years after production of the first ton of the product RusVinyl produced one millionth ton of suspension PVC. Gleb Nikitin congratulated the employees of the company with this event and wished the plant stable and successful work for many years ahead. «Such production companies as RusVinyl are needed for the overall wellbeing of the Nizhny Novgorod region. With such a company you can be more confident about the future”, -Mr. Gleb Nikitin noted at the end of his visit. “Our production capacities are 330 kt of PVC per year. Such large production unit positively influences the economic development of the country, solving the import substitution task, as is also dedicated to develop a deeper processing and consumption of the petrochemical product. One year after the other RusVinyl has been confirming by its stable operation the leading position in the Russian polymer market. Whereas the quality of the product remains on the stable high level. We are planning to keep the set pace in our operation and will continue developing our company and developing ourselves alongside of it,” – Mr. Guenther Nadolny, the CEO of RusVinyl, mentioned in his conversation with the head of the region.